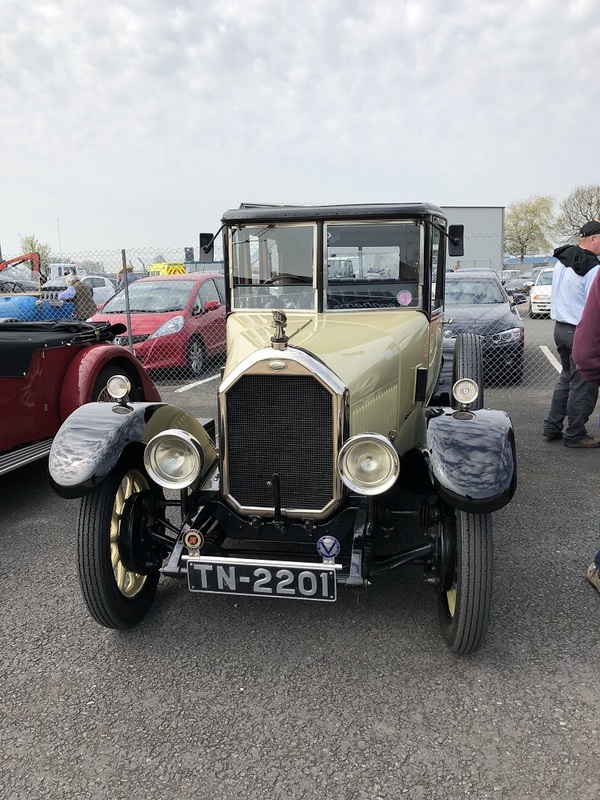 Welcome to Part 3 – the final part of our report on our visit to the first day of the VSCC Formula Vintage 2018 Round 1, on Saturday 21st April. In Part 1 we looked at the racers, and in Part 2 the sports cars. Now we’ll look finally at the Great Cars. 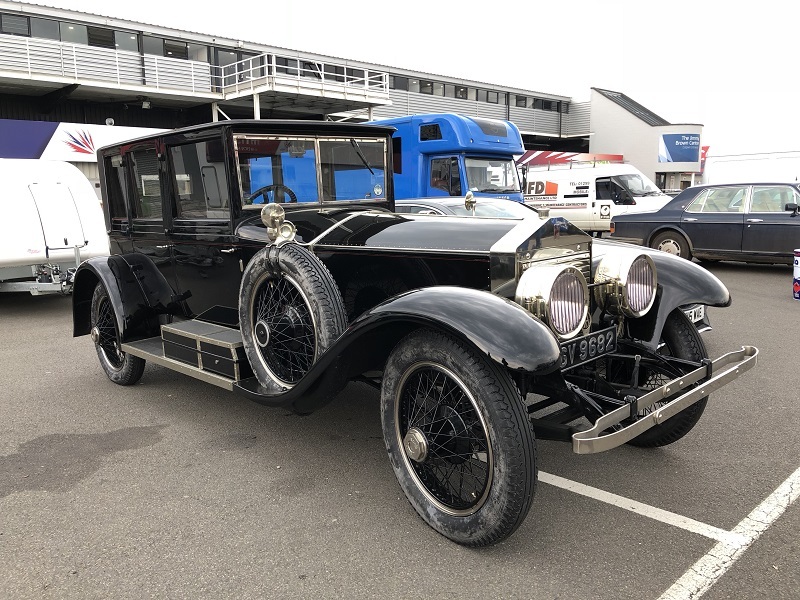 Once again, we’ll use a fairly broad definition: if it tends towards the more luxurious and is closed, it’ll go here – but we have included one open car, because it is irredeemably posh. 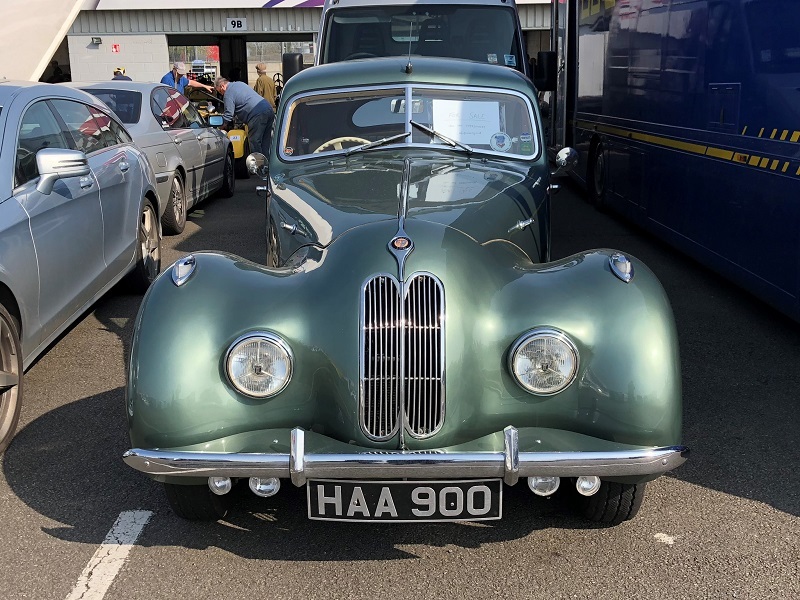 We took a picture of this Bristol because it looked so lovely – but it’s a bit more special than that. Fully restored and upgraded, it was entered in the 2016 Mille Miglia and finished without any faults. Retro trip meter, map light, fire extinguisher, intercom, headsets, race battery, extra road wheel and general rally preparation. This car was in superb condition. the 14/40 was the 1927 replacement for the earlier 12/25. It has a 2,050cc 4-cylinder inlet-over-exhaust engine. 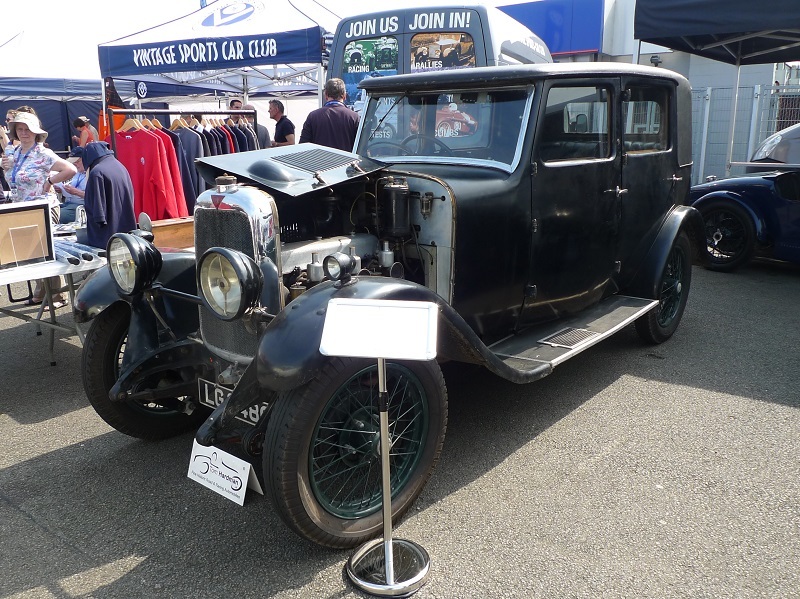 This model became one of the most popular and successful of Humber’s vintage output. 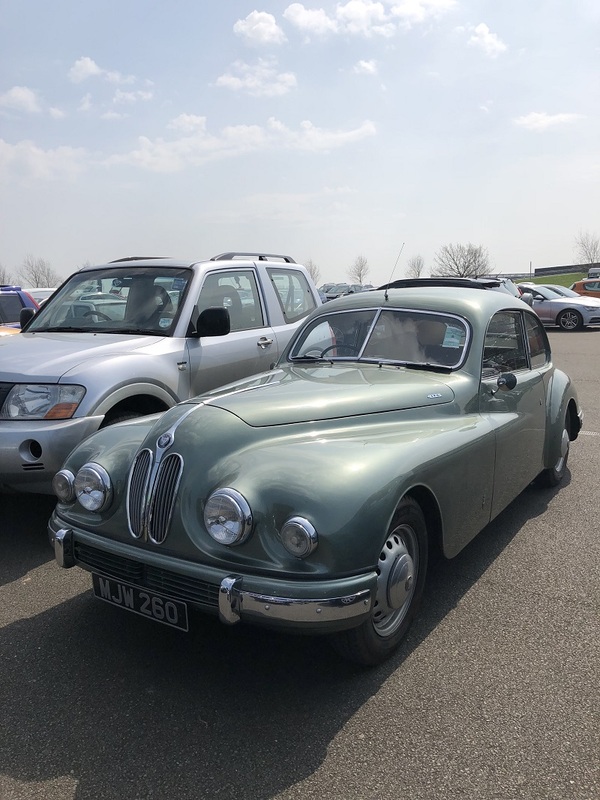 Tom Hardman of Clitheroe was selling this car. 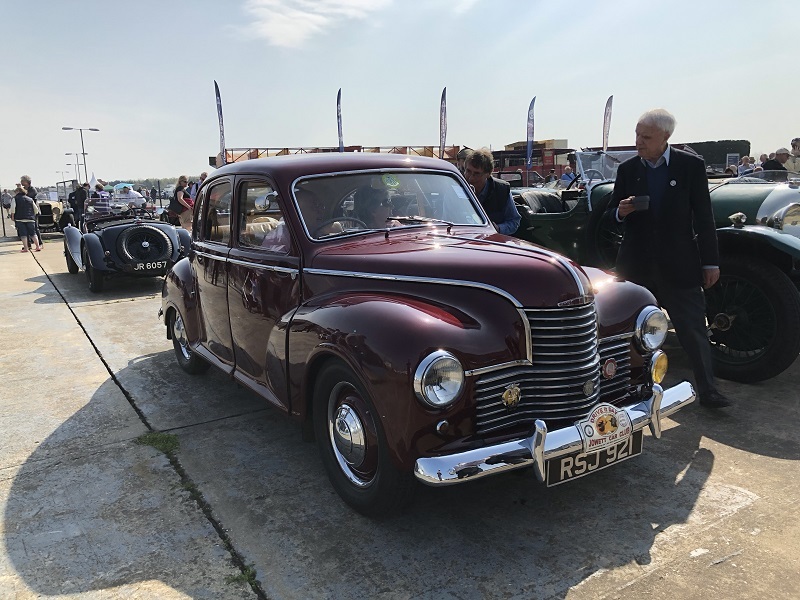 In perfect, unmolested ‘Oily Rag’ condition with its original Carbodies coachwork and its mechanicals in top order, it has an experimental 4-cylinder 19.82hp engine of 2,511cc (the same as that fitted to the 1932 Speed 20 SA), fitted in 1956. It is the sole survivor of its production of only 5 cars. It also has a Rawlings patent “finger chopper” driver’s window that allows for hand signals to be administered quickly (if not safely!). 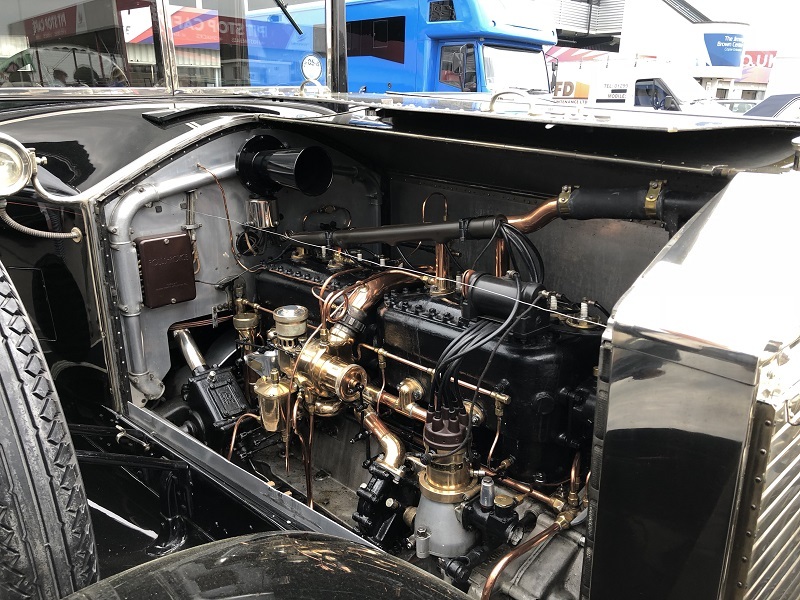 The engine was originally cast before 1931, which makes the car genuinely vintage. This is the car that is not closed but is very posh. With a replica Barker body, chassis 60UA is one of four Ghosts in the possession of the owner. Full of enthusiasm for his cars, he told us that he uses them for charitable events whenever he can. because the thematic colour of one of these occasions was a bright purple, he had one of his Ghosts repainted to match. And then sprayed back to a more sober colour afterwards. A very proper use of quite a lot of money. Another excellent Bristol. The last “Aerodyne” (in the words of LJK Setright) before the rather different style from the 404 onwards. This would probably be dismissed by those not in the know as a dumpy, slow French car. Not a bit of it. 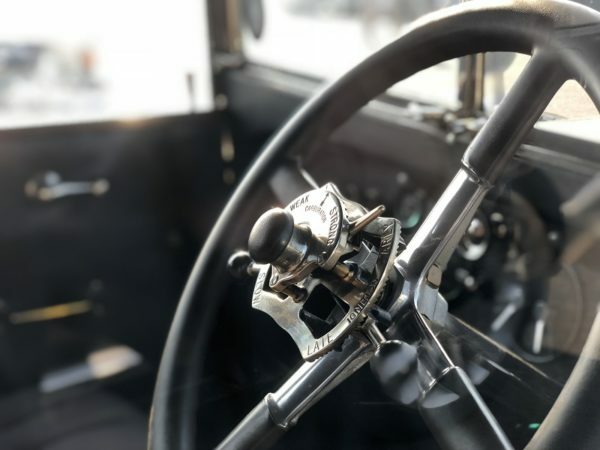 The Hotchkiss was a meticulously designed and beautifully made luxury car; a Grand Routier capable of setting high average speeds along the Routes Nationales of pre-war France. 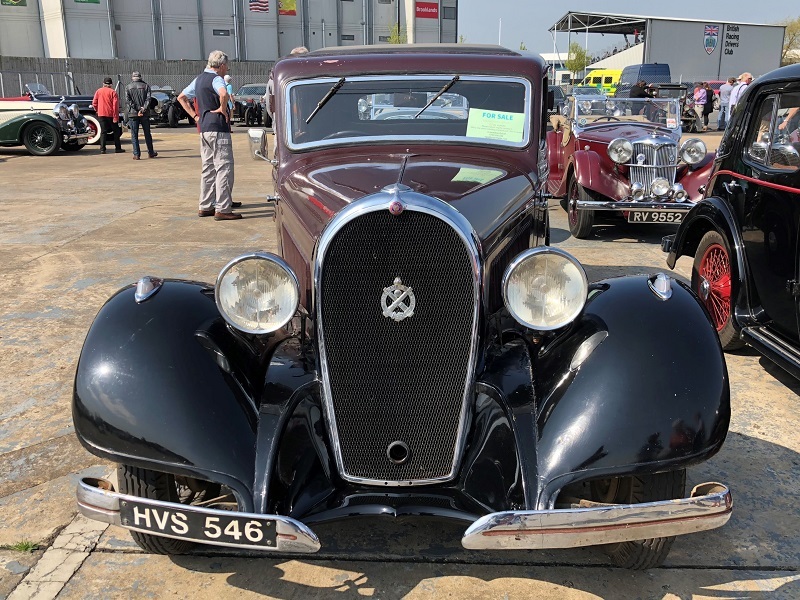 The 413 was a 13CV 4-cylinder of 2.3 litres displacement. Indeed it is. 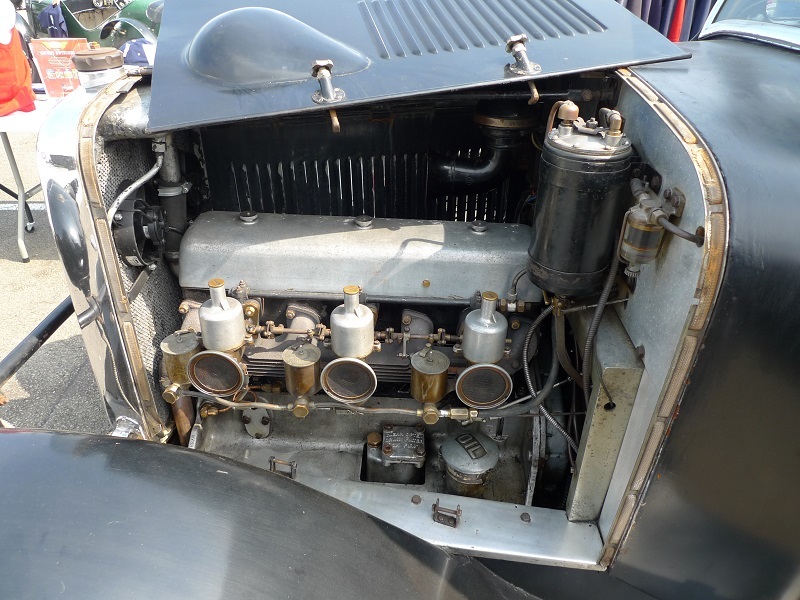 All was solved on the day when we found the bonnet open – and the twin cylinder blocks of a 40/50 could be seen. The owner is Brian Fidler; he generously and enthusiastically showed us round. 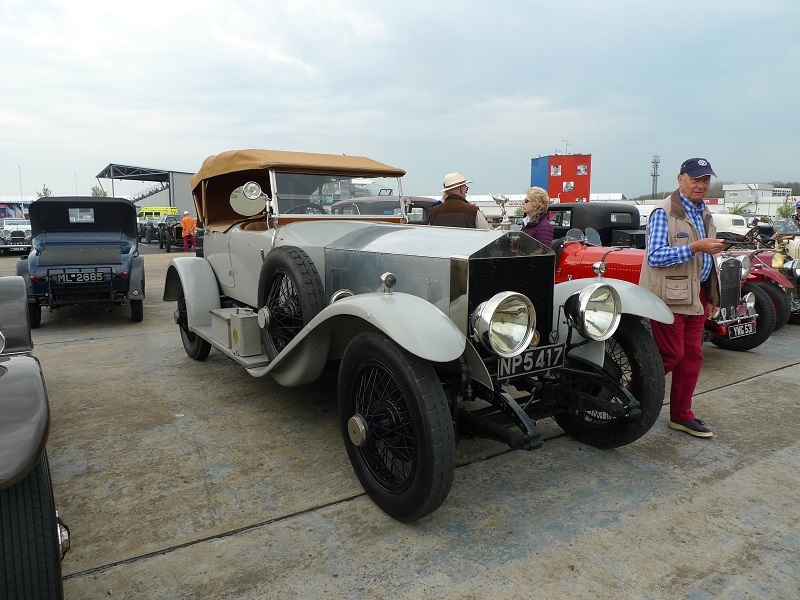 This car dates from the last year of what Brian calls “proper” 40/50 Silver Ghosts made at Rolls-Royce’s own factory set up in 1921 in Springfield, Massachusetts. 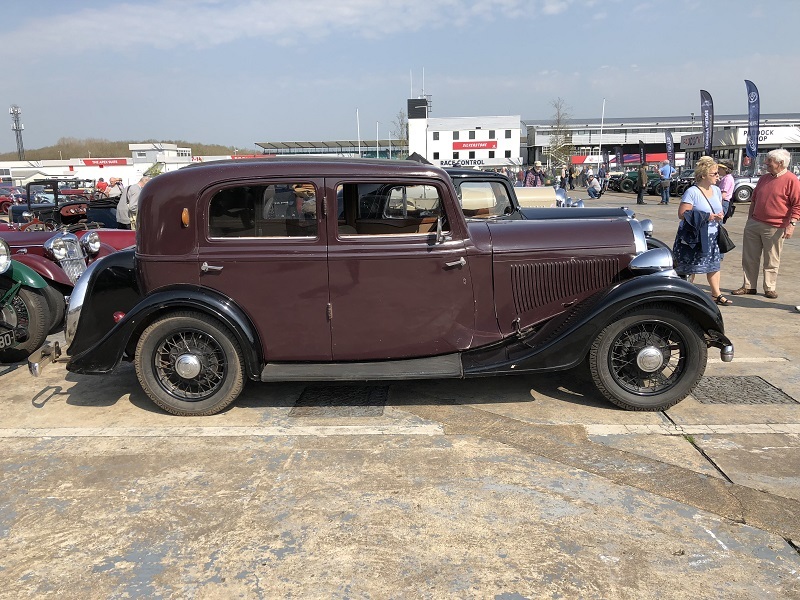 It has some American lighting and electrical equipment but in all other respects is made to the exact and exacting standards set by Derby: four-speed gearbox with right-hand gate change; right-hand drive; 12-volt electrics. 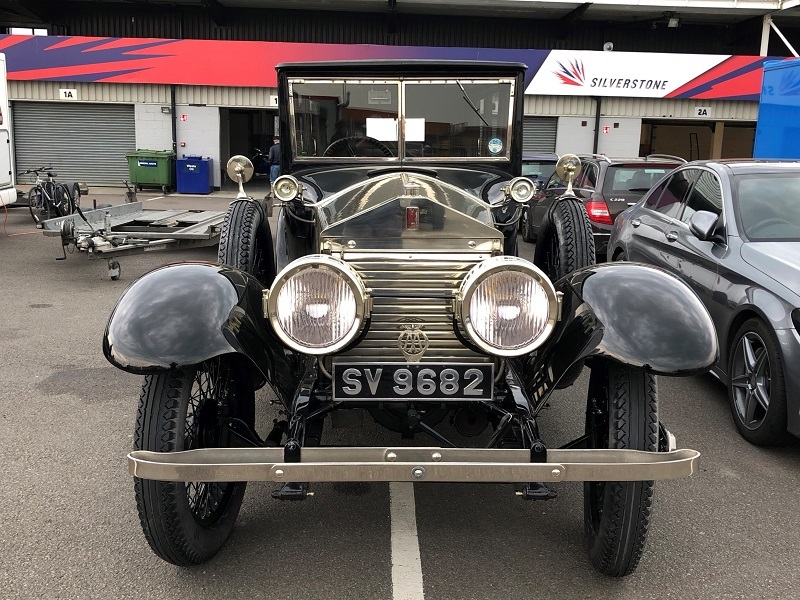 In 1925, Brian tells us, costs constraints forced Rolls-Royce to cheapen the specification and introduce a centre ball-change 3-speed gearbox and American 6-volt electrics. At the same time, in an attempt to attract more customers, they switched to left-hand drive. The biggest surprise lay inside: unlike the majority of Springfield Ghosts, this does not have a Brewster body. 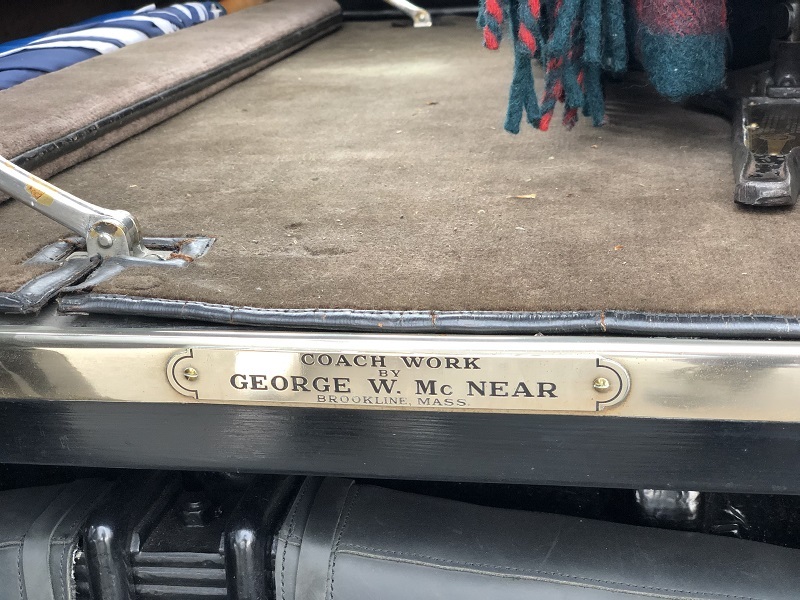 It is one of 10 cars clothed by the George W McNear Company in Brookline, Massachusetts. All but one were four-light bodies, with privacy provided by the windowless rear quarter. But the first owner wanted to see the countryside as he passed by – and demanded a six-light body. So this body is almost certainly unique. 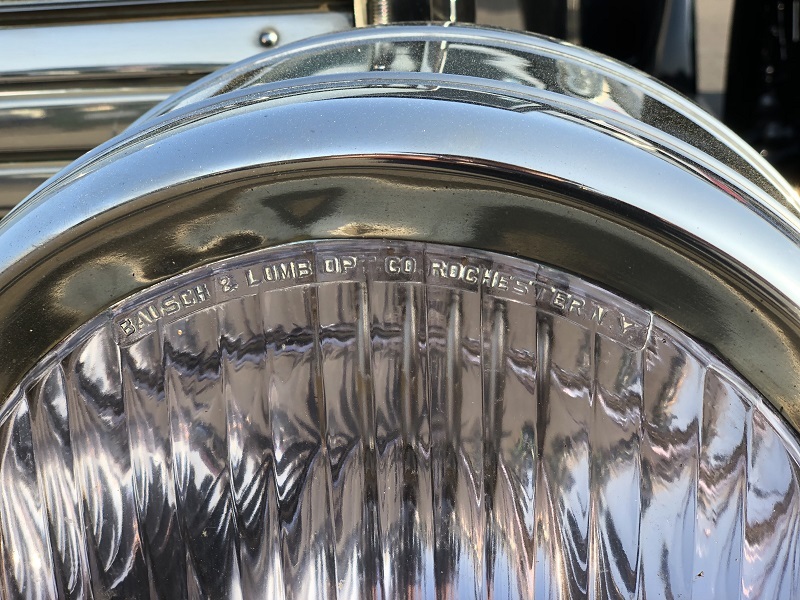 These drum headlamps are a characteristic of (most?) Springfield Rolls-Royces. 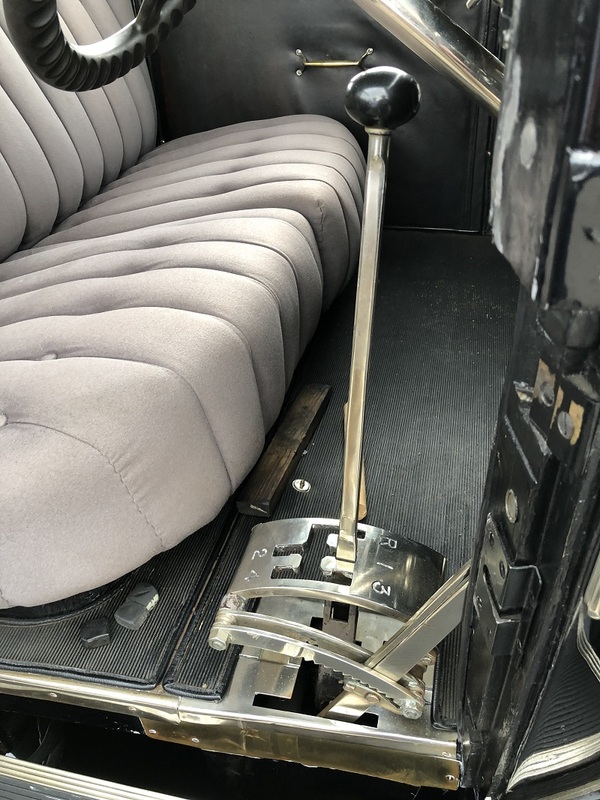 The controls for engine speed, ignition timing and mixture can just be seen emerging from the base of the steering column. It was only at the SAHB Spring Seminar on the following weekend that we realised how much of an enthusiast Brian Fidler is. He is also the custodian of ERA R4D – the subject of Mac Hulbert’s talk (see our event report on the left of our main page) and arguably the greatest of all the ERAs. Thank you for looking at our three reports from Silverstone. We hope you’ve enjoyed them. Please let us know what you think in the comments section below. It’s there for everybody – not just SAHB members!